mother of 3 when she was killed on January 16, 2000. In the early morning hours of January 16, 2000, a couple driving along Bench Boulevard in Billings, Montana, spotted a car on fire. It was about 3:30 a.m. The car was in a graveled parking lot/ pull-off area of MetraPark. Firefighters and police responded quickly. The fire proved difficult to extinguish. When the trunk of the 1987 Cutlass Sierra was opened, authorities found the body of 34 year-old Jeannette "Charlie" Atwater inside. The car was registered to Atwater, but it took dental records to make a positive identification, since the remains were burned beyond recognition. Police held back certain details of the crime. They publicly disclosed is that Atwater died of smoke inhalation, meaning she was alive when placed in the trunk. A gas container and matches were found near the car. 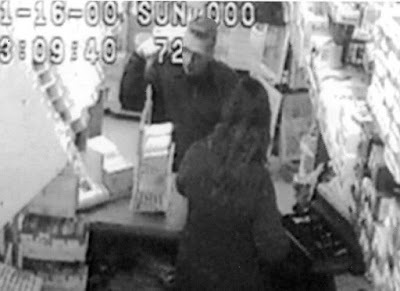 This became a significant clue when police found security footage from a nearby Cenex gas station. Shortly before the car was found on fire, an unidentified man was captured on video buying $1's worth of gas (in coins) and taking a packet of matches. According to the store clerk, just after 3:00 a.m., a small, brown hatchback with an orange stripe, pulled into the outermost pumps at the station. Police have described the car as possibly being an older compact, perhaps a 1980s vintage model. The clerk could not see if the man was alone. at Cenex Station. Time-stamped 3:09 a.m. on 1/16/2000. Additional security footage of unidentified man at Cenex Station. Composite drawing of what man's car may have looked like. The unidentified man has been described as a white male with brown hair, possibly in his 30's. His estimated height is listed in some sources as 5'8" or 5'10". He had light acne scars on his face. He wore dark coat and pants. The store clerk said he smelled strongly of aftershave or cologne. Jeanette Atwater often went by her nickname, "Charlie." She was the mother of 3 children. For more than 16 years her family has had no answers. Police have not been able to uncover the motive for this crime. Atwater was described as well-liked, with no addictions or financial problems. This led some to question whether it was a random act of violence. The night she died, Atwater attended a company banquet for the NAPA distribution center where she worked. Before she disappeared, she had been with co-workers at the former Player's Club bar, near where her car was found. Police were not able to find any conclusive footage or witnesses of Atwater leaving the bar. In fact, her whereabouts between the last time she was seen and when she was found remain unknown. Her colleagues do not remember her being part of the group as they left the bar at closing time. By 2:15 a.m. the Player's Club parking lot was empty. According to this Billings Gazette article, "bar employees monitored the parking lot... no one recalls any kind of disturbance." There was a monster truck show as well as a semi-professional basketball game taking place locally that night. Police have wondered if the unidentified man may have been traveling through Billings and attended one of these events. Both the Player's Club bar and the pull-off area, where her car was found, were located near MetraPark, a multi-purpose arena. Did you see something that night?